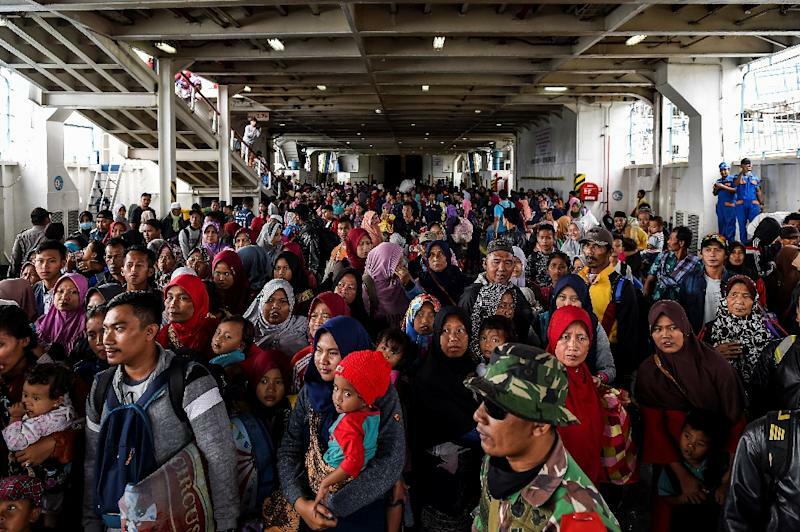 Carita (Indonesia) (AFP) - Indonesian search and rescue teams Wednesday plucked stranded residents from remote islands and pushed into isolated communities desperate for aid in the aftermath of a volcano-triggered tsunami that killed over 400. The agency also said that wind was blowing "ash and sand" from Anak Krakatoa to the nearby towns of Cilegon and Serang on Java, and advised residents to wear masks and glasses if they had to venture outdoors. 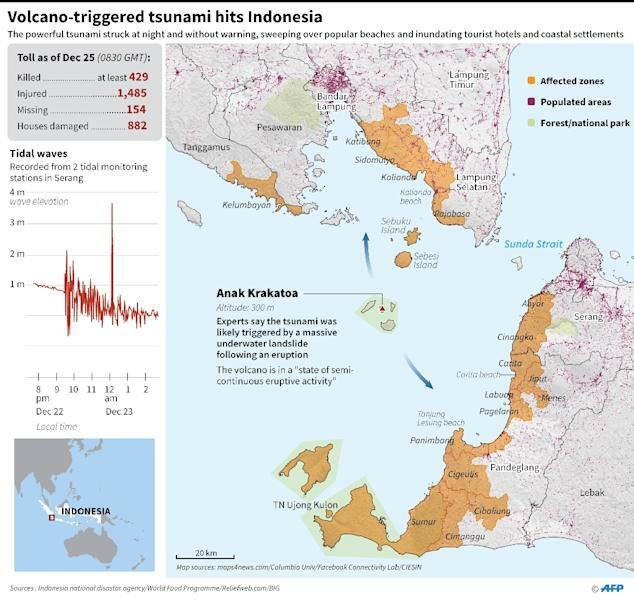 A section of the crater -- which emerged at the site of the legendary Krakatoa volcano, whose massive 1883 eruption killed at least 36,000 people -- collapsed after an eruption and slid into the ocean, triggering Saturday night's killer wave. Medical workers have warned that clean water and medicine supplies were running low -- stoking fears of a public health crisis -- as thousands of displaced survivors cram shelters and hospitals. 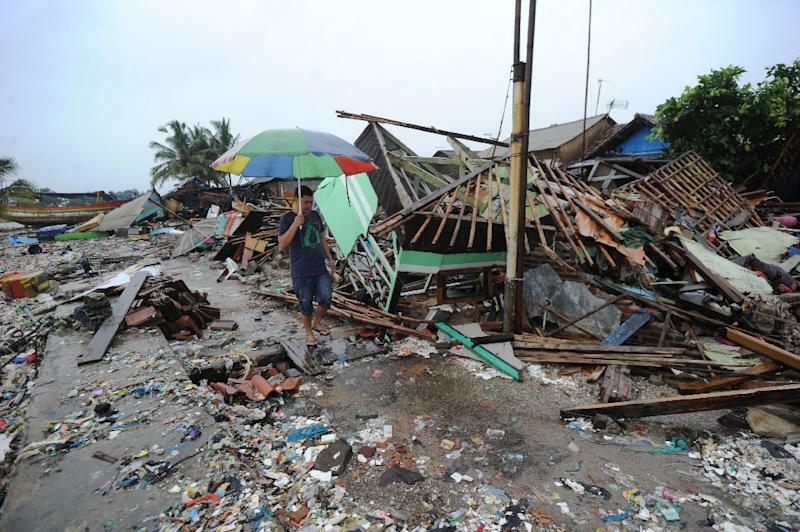 The disaster agency dispatched helicopters to drop supplies into hard-to-reach communities, while hundreds of residents on tiny islands in the Sunda Strait were airlifted or taken by boat to shelters. "We tried to stay because it's our island, but after a while we got scared," said Sariyah, a 45-year-old resident of tiny Sebesi island, who evacuated to the mainland on a boat. "My house has been destroyed so there's no more reason to stay." Sniffer dogs are being used to find those still missing as grief-stricken relatives line up at identification centres. But hopes of finding any survivors beneath the rubble have dwindled. Tubagus Cecep, 63, waited nervously at the area's main identification centre to see if a body was that of his missing son. "I'm scared my son is dead, but if I keep my faith in God maybe he could have been swept away somewhere and is still alive," he said. At the Tanjung Lesung resort, cars and minibuses had been thrown against buildings, concrete walls cracked into small pieces and trees uprooted. A wooden sign that read "Good Times" lay on the ground. The tsunami struck the resort as more than 200 workers from the state electricity company were watching pop band "Seventeen" perform. The four-member group was hurled from the stage as the water slammed into the audience -- only the band's lead vocalist survived. On Wednesday, thousands prayed for loved ones at mass graves and mosques to mark the 14th anniversary of the 2004 Boxing Day tsunami, which killed some 220,000 people in countries around the Indian Ocean.